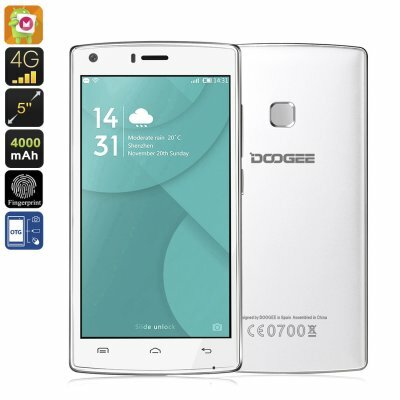 Successfully Added HK Warehouse Doogee X5 Max Pro Smartphone - Android 6.0, 5 Inch Display, OTG, 4G, Dual-SIM, 2 IMEI, 4000mAh Battery (White) to your Shopping Cart. The Doogee X5 Max Pro - a budget smartphone that represents the features and technologies comparable to that of many high-end smartphone models. Featuring an Android 6 Operating System this Chinese smartphone brings along the latest features and provides you with an exceptionally smooth user-experience. This stylish budget phone holds a 5 inch HD screen that displays vivid colors and portraits sharp images – allowing you to enjoy all your media to the utmost. On the back the Doogee X5 Max Pro you will find an ultra-fast fingerprint scanner that is capable to fully secure your phone and unlock it in a split second. More than just a simple scanner this fingerprint scanner allows you to program 5 different fingerprints and match them with a different action. From now on you can use your index finger to unlock your phone, middle finger to enter your favorite app, and ring finger to activate your camera without the need to navigate through your phone.